Darrelle Revis was one of two Buccaneers to make the Pro Bowl last season. TAMPA, Fla. — The trade for five-time Pro Bowl cornerback Darrelle Revis was the coup of the Tampa Bay Buccaneers’ offseason last year. But his time in Tampa could soon be over. FOX Sports 1 NFL Insider Alex Marvez reported Monday night that the Bucs are increasing efforts to trade the three-time All-Pro. The reason? New coach Lovie Smith and new general manager Jason Licht could view Revis’ salary of $13 million a year and his $1.5 million in bonuses too much of a hindrance as they attempt to shape Tampa Bay in their image. If the Bucs are unable to find a trade partner, they could simply release Revis, 28, before he’s due a $1.5 million roster bonus Thursday. That would mark an unexpected end to his brief stint in Tampa Bay, which included 50 tackles, two interceptions and one sack during a 4-12 season in the final year for former coach Greg Schiano and former coach Mark Dominik. 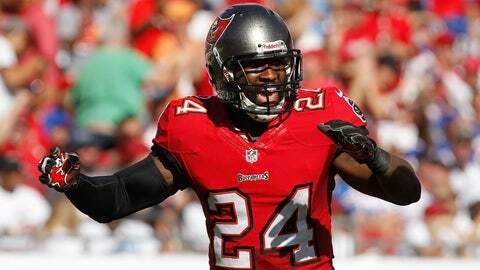 Revis was one of two Bucs players named to the Pro Bowl, joining defensive tackle Gerald McCoy. Last April, the Bucs traded for Revis, giving the New York Jets a first-round pick in 2013 and either and third- or fourth-round selection this year. If Revis isn’t on the Bucs’ roster after this week, the Jets receive the fourth-round pick. Though Smith favors a Tampa 2 zone coverage defense as opposed to Revis’ man skill, he made clear he was interested in Revis’ talent shortly after being hired in January. "There’s a reason why we have Tampa-2 associated to one of our coverages, but I just want you to know, especially (in reference to cornerback) Darrelle Revis, we don’t play Cover-2 every snap," Smith said then. "We have a place for a great cover corner that’s physical and can do all things."